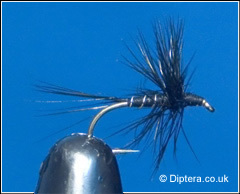 The black midge is an ideal fly when small black flies are on the scene. Fish the fly on a floating line either static or using a slow twitching retrieve. Had numerous good size rainbows on the midge pattern over the last two months especially on an evening. You will really need to de-grease the leader and gink up the fly.